Yesterday I got myself ready for this month's Brown Owls, which is on this Sunday. We're having a knitting day and hopefully learning enough to follow a simple beanie pattern. 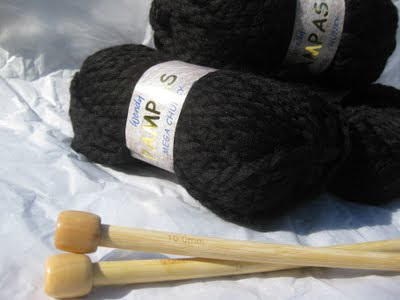 As you can see, we're going the chunky wool and fat needles option for easiness and more importantly, speedy crafting! I got my lovely bamboo needles and chunky wool from Wooly Lattes, the needles were on sale for $5! I've also done a bit of dabbling in graphic design, but not really because I used picnik, and whipped up this little flyer for our Brown Owls group. I'm quite pleased with how it turned out but I reckon picnik needs to do a sewing/craft theme of stamps and stuff, that would have been awesome! On retrospect, I should have made the owl brown but oh well. Today's plan (for the afternoon) is to get head down bum up into some school work. Planning for next term. What fun. I'm being filmed a bit over the first three weeks doing my teaching thing for a course my school is running in language programs. I am Really. Looking. Forward. To. It. (Where is that sarcastic font when you need it?) I hate being filmed. Fingers crossed I don't have to see the footage. Eugh. I want to be really organised so I don't freak out (which I'm sure I will do anyhow). I'm off to explore the other creative spaces until afternoon kicks in and school work beckons. Afternoon doesn't start til 2pm right?? Why isn't there a sarcasm font? I think it'd clear things up immensely. I think you'll be an excellent knitter based on your crocheting! 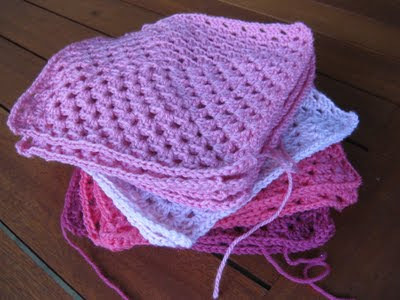 You are more than half way through the crocheted squares, 16.5/30 is exactly 55%!! Have a great time knitting your beanie. Oh your Picnik work is so lovely, you are so clever. Oh yuck, I would hate being filmed too, and I recognised your sarcasm without a font. You must be doing a great job to be demonstrating for filming!! See you Sunday I hopeses. Chunky wool and needles are great! I am very impatient and love speedy knits! You're inspiring me to want to get my knitting needles out! I have a cardigan I started just before Baby Holly was born nine months ago and it's still unfinished. I started blogging and unfortunately now my poor knitting has been neglected. I really must start dedicating some time to it. I got the same needles thanks to this post :). The lady was very helpful! She gave me her number and said we should call her if we ever want her to come along to a meeting and troubleshoot!